An indepth look at the bi-annual A-10 competition held last year at the former England AFB, now ALexandria IAP. USAF Fighter Deployments to Europe since 1970. Kevin Jackson flys with the RAF during this years Birthday Flypast over London. Sharpshooter is a web based journal of military aviation photography and features. The journal has been established by a small group of UK based photographers, to provide an informative and high quality web site offering coverage of the contemporary military aviation scene. The site will specialize in coverage of the military air arms of the United Kingdom and the United States of America, but also of European, NATO and other forces whenever possible. Photo articles will include reports on exercises, deployments, photo events and base visits, in addition to features on individual squadrons, colours and markings, and comprehensive aircraft type operator run downs. With the air arms of 2000 considerably downsized from those of the early 1990s and before, it is also hoped to offer in depth retrospective features, covering deployments, units and bases from those days of more plentiful flying and more colourful schemes and markings. Through our own extensive slide collections, and those of fellow photographers and other sources, we have a considerable archive of never before seen material, and hope to be able to share these images with all who share an interest in this fascinating field. We would also be happy to receive material for possible inclusion in these pages (see OP's Board below). Contact us with an outline of your AAR mission flightplan!, or photo-feature idea and we'll get back to you. 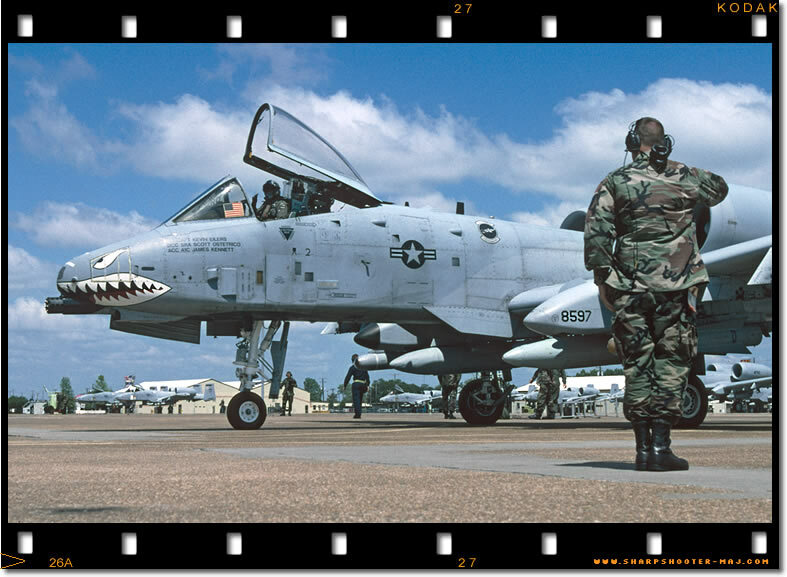 With a final salute, a 23rd Fighter Group A-10A heads for the runway at Alexandria IAP and home, after competing in Hawgsmoke 2004. Check out our photo reports from previous PhanCon's 97, 98 & 99 to see what you missed so far! This site is best viewed at full screen 1054x768 resolution and High colour (16bit) or even better True Colour (24 or 32bit). Of course you can view at lower resolutions but unfortunately you'll have to scroll horizontally as well as vertically. Also it will be beneficial to use a Version 4 or above Web browser (IE5 and above or Netscape 6 are recommended). Browser font size should be set to medium or smaller. CAUTION If viewing with Netscape Navigator (prior to version 6) some pages will not display correctly. At present we do not know why, but were working on this problem. This problem (pages all jumbled up/text over pictures etc) does not effect Microsoft's Internet Explorer. For people who are interested the site is designed using Macromedia Dreamweaver MX 2004 Studio. Photo's are scanned from Kodachrome Original slides using a Nikon Coolscan V ED scanner and are manipulated (only a little!) in Adobe's Photoshop CS2. Feature and Photo* submissions are always welcome. As this is a voluntary and non profit making organization we can not pay for any articles/photos but hopefully the satisfaction of seeing your work published on the World wide web! will be payment enough!! As a guide to picking a topic please have a look at our Departments section below. Please contact us first via e-mail with a rough outline of your proposed article. In return we will send you an e-mail detailing our requirements i.e. Photo/Scan formats, caption data etc. * At this time we cannot use individual photos and/or scans.